Over ten years ago, we set a goal as a company to manufacture the best 5-axis CNC machines with the best control and software in the industry. The reason is simple: we determined 5-axis technology would make our customers more profitable. Our 5-axis CNC machining centers, equipped with the integrated Hurco control, are simply the best in the industry. Nobody does 5-axis better than Hurco. And nobody gets you from print to part faster. Fanuc compatible. Fast processor. Rigid. Precise. Accurate. Do your 3-axis parts in half the time with 3+2 on a Hurco. 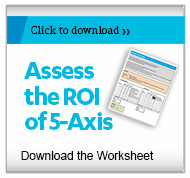 Our technology makes 5-axis easy so you can be more profitable. 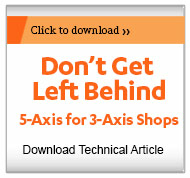 Benefits of 5-axis swivel head machine configuration. Benefits of 5-axis trunnion table machine configuration. "With the VM10U, we went from 9 operations to 2 on this military part. We save 40 minutes per..."
A rigid machine that is fully compatible with all CAD/CAM packages for simultaneous 5-axis machining with complete Fanuc integration is a minimum requirement for complex simultaneous 5-axis parts. 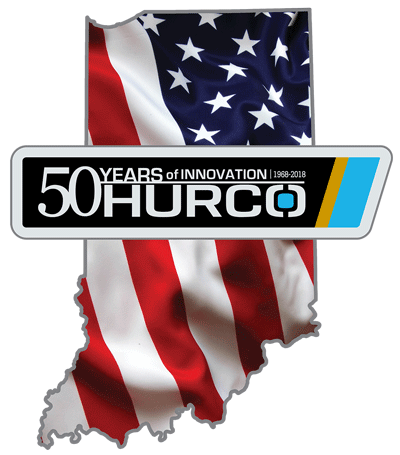 Hurco has all that and more. 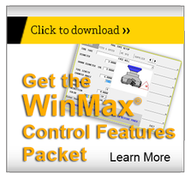 We have control features that optimize CAM programs to reduce the file size, improve surface finish, and reduce cycle time. Additionally, you’ll appreciate the fast processing speed and generous 2 GB RAM. Even if you don’t require simultaneous 5-axis right now, a Hurco 5-axis machining center will immediately increase the profit margin of the parts you currently manufacture on a 3-axis machining center. Switching from 3-axis to 5-sided machining on a Hurco 5-axis machining center is seamless because our control is equipped with powerful conversational programming features for 5-sided--and no CAM system needed. You program right at the machine. It is the easiest, most intuitive interface on the planet. The swivel head / rotary table 5-axis machines (SR style) can handle heavier parts than the trunnion style 5-axis machines. Since the swivel head tilts the tool, you don’t need to worry about tool interference with the machine’s spindle head on the SR machines. Additionally, the SR design gives you more versatility because of the large table size. You can add a vise and use the extra table space to finish the sixth side of the part or do 3-axis work. Premium components, such as oversized linear rails, high accuracy encoders, and an integral spindle, result in a rigid and reliable 5-axis mill you can count on for the most complex applications. A trunnion style 5-axis machine has better undercut capability because the trunnion rotates +110 degrees compared to the swivel head’s +92 degrees. The trunnion style gives you a larger work volume than a swivel head 5-axis mill because you don’t need to compensate for the space used by the swivel head with the tool attached. The trunnion 5-axis also gives you more torque at low rpm. If you are new to 5-axis, some customers find this configuration beneficial because the approach to the part is similar to 3-axis machining—you are simply machining more sides at one time in a linear fashion. As with all Hurco machining centers, you have the peace of mind that it is constructed to promote rigidity and accuracy with oversized linear rails mounted to the shoulder, dual wound spindles with ceramic bearings, and high accuracy encoders. “With the VM10U, we went from 9 operations to 2 on this military part. We save 40 minutes per piece in cycle time alone and easily save an hour and 10 minutes total. Maybe even more important to our bottom line is the fact that the operator is running two other machines while the VM10U is making chips,” — Keith Dalpe, EMM Precision. “The Hurco 5-axis VMX30U saved us 4,000 setups on just one part. When the part was milled on the three-axis machine, five sides were completed in eight to 10 hours, including repeated manual re-fixturing. The part is now machined in around three hours on the five-axis Hurco. As only one additional set-up is needed for machining the sixth face, the component is produced in two milling operations followed by sparking.” — RST Engineering. — ​Larry Curry, Dreyer & Reinbold Racing. — John Gregorich, Gregor Technologies.